Category: $5,001 - $10,000, Feature Greenhouses On Sale, Five Wall Polycarbonate Greenhouses, Free Standing Greenhouses, Traditional Series, Traditional Series - On Sale, More.. This feature 16mm five wall free standing polycarbonate greenhouse kit is one of our top sellers and is considered one of our top Best Buys! 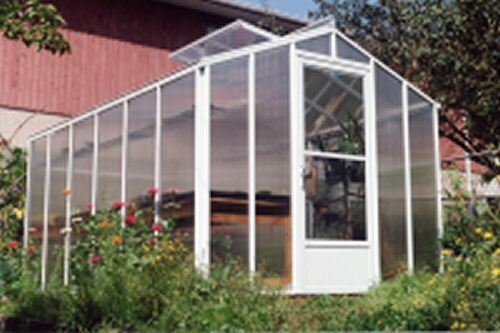 This quality greenhouse is highly functional in colder climates and is built to withstand harsh weather conditions. The durable aluminum frame comes with an attractive paint finish. Large automatic roof vents provide air circulation and the wide storm/screen door comes with a key lock. It has been designed and constructed to the highest engineering standards for over 50 years! Height to center peak is 7' 7 5/8"
All greenhouses benefit from air circulation. ..